You drive from the harbor through the cultural center of Tallinn along the lively main street towards the central park of Kadriorg - originally founded by Peter the Great. Continue on to visit the Song Festival Ground where national song festivals with some 30,000 singers are held. From here, you drive through one of the most beautiful residential areas of private houses until you arrive in Pirita Marina – the former site of Olympic yachting and still host to many international competitions. You will enjoy an outside view of the 15th century St Birgit’s convent and see a marvelous example of local limestone architecture. On your return trip to the city centre you’ll pass the Russalka mermaid, a beautiful monument dedicated to the shipwreck in 1893 and the eye-catching summer residence of Count Orlov. Approaching the Old Town you’ll get fascinating views of the medieval city wall with its fairy-tale turrets. You disembark and start your guided walking tour in the Upper Town with its watch-towers, graceful spires and winding, cobbled streets. Visit the Russian Orthodox Church, inaugurated in 1900 and filled with a stunning array of superb icons and get an outside view of the 13th-century Gothic style Dome Cathedral. 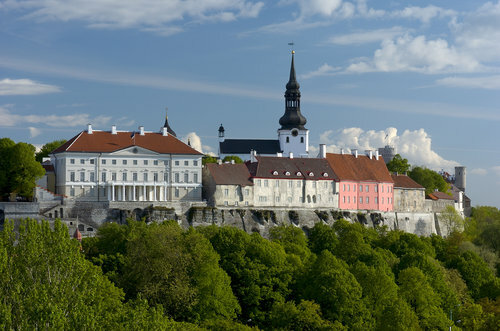 You will view the exterior of the Castle which is now the seat of Estonia's parliament. Built on a cliff top the Upper Town provides superb vantage point from which to view the red-gabled roofs and spires of the Lower Town. Your tour continues in the Lower Town. Among the highlights here are the apothecary, which opened in 1422, the Great Guild House, Black Heads Brotherhood House and the 15th century Gothic Town Hall (all from outside). On the grounds of the Dominican Convent is a colorful market, St. Catherine's arts and crafts center, where you can enjoy some free time. Your driving part of the tour will end near the Nun’s Gate where you can then walk to the historic city center. Here you can see the real highlights of the Old Tallinn - medieval guild houses, the Gothic Town Hall and the 15th century Pharmacy (outside). You can enjoy some free time in the city centre before you return to the pier either by taxi or walking (about 35 minutes).